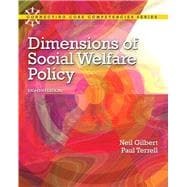 Neil Gilbert is Chernin Professor of Social Welfare at the University of California, Berkeley, and Co-Director of the Center for Child and Youth Policy. His publications include thirty books and over 100 articles. Several of his books have been translated into Chinese, Japanese, Korean, and Italian. His work, Capitalism and the Welfare State (Yale University Press) was a New York Times notable book. His most recent book, A Mother's Work: How Feminism, the Market and Policy Shape Family Life, was a Society notable book and an Atlantic Monthly selection. Gilbert served as a Senior Research Fellow for the United Nations Research Institute for Social Development in Geneva. He was twice awarded Fulbright Fellowship to study European Social Policy as a Visiting Scholar at the London School of Economics and at the University of Stockholm. He has also served as a Visiting Scholar at the International Social Security Association in Geneva. Paul Terrell is a Lecturer at the School of Social Welfare, University of California, Berkeley where he also served as the Coordinator of Academic Programs. He has recently taught at the School of Social Development and Public Policy at Beijing Normal University, Beijing. Terrell served as Research Co-Director, Proposition 13 Monitoring Project, National Association of Social Workers and was Associate Director, Regional Research Institute in Social Welfare, University of Southern California. He has coauthored The Social Impact of Revenue Sharing: Planning, Participation, and The Purchase of Service (Praeger Publishers) and Social Services Contracting in the Bay Area (Institute of Governmental Studies: U.C., Berkeley). His articles include studies of advocacy in social work, financing social services and privatization.